Our solid iron Campaign Daybed represents the finest example of the style available. The extensive hand forging and exact proportioning has made it the benchmark of quality for more than a century. Two sizes available. 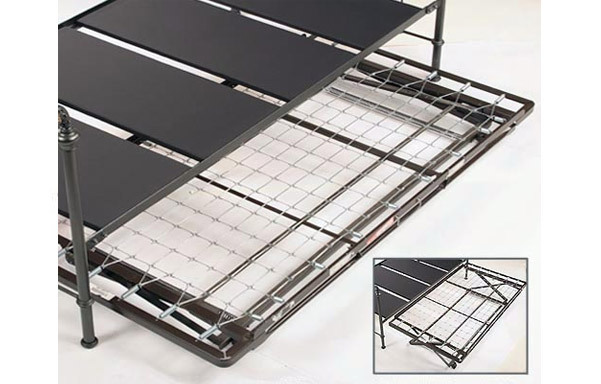 Optional trundle unit stores a mattress underneath. It pulls out and pops up for use as a second bed when needed. Review: "Often you see a picture online only to be disappointed by the product when it is received. This was not the case for this daybed. We love it and it really fits the space where we needed it. I've been told it's very comfortable too." Review: "The Campaign Daybed is an excellent product. Well constructed and sturdy. The design fits any kind of room. I wanted to try the euro-slats and I made the right choice -good support- . The mattress is very comfortable; great support. Also, I would like to emphasize that the communication between Charles P. Rogers and myself was very helpful in order to make the right choice. Thank you. Gigi"
Review: "i'm a fan of the Charles P Rogers products having purchased them in the past. i bought this bed with the pop up trundle and both mattresses. i wish the mattresses were more comfortable but these beds are for my spare bedroom for use for guests (hopefully) not staying too long! the bed and trundle don't take up much room and look modern and simple." Review: "I LOVE this bed, it's comfortable and fits the room perfectly as a couch when not being used by guests. However, there are NO SHEETS available to fit the 33 inch wide bed and Charles P. Rogers was no help at all in finding appropriate sheets. I was told -- search the internet! And I did and could not find any sheets to fit. I called the store and was told to use standard twin sheets. Standard twin sheets don't fit this bed, they bunch up and are uncomfortable and messy. I'm now having to have sheets ALTERED to fit this bed. I think Charles P. Rogers should stock sheets that fit this bed. They do everything else so well, I'm surprised they have yet to solve the sheet problem with the daybed. Blonde Beauty"
Review: "The bed I purchased was easy to assemble and it is more sturdier and better built than I expected. I am very well pleased with doing business with your company. Lloyd Breckenridge Elizabethtown, NC"
Review: "I can't be more pleased. It was easy to set up, very sturdy, very comfortable. The perfect solution to needing an office that can function as a guest room." Review: "Best daybed. Sturdy, easy to put together. Love it." Review: "I love this daybed. I searched for a daybed for a long time and finally settled on this one and I am not disappointed. It happened to be on sale when I finally went to purchase, so that was great, too! It is well-made of quality materials, easy enough to put together, and is working out just great for me. The mattresses are definitely firm. That's a plus when sitting on it as a couch for reading, but a little hard for sleeping. I put a memory foam pad on both mattresses under the sheets and that took care of that. As to style, I think it is wonderful--elegant without being too fussy. I live in a renovated barn so I didn't want more wood, but I didn't want all that girly, scrolly stuff either. This bed is just right. Charles P. Rogers was on it, too, as far as processing the order right away. I had a tracking email within two days of my order and I was really impressed. DHL, however, took forever getting the bed here. I live in a rural area, but it isn't that far out. UPS and FedX get here all the time with no problem. So, perhaps a different carrier? I received free shipping on my order, though, so I'm not going to complain any louder than that. All in all, two thumbs up on the whole experience!" Review: "The Campaign Daybed is so attractive and flexible to use. For a really small bedroom, this is the perfect purchase. It can be used as a daybed/couch to watch television on a daily basis and when you have guests, use it as a queen bed, or if you have your grandchildren, pull out the trundle and you have two twins. Plus, it's great looking! We purchased one for the beach condo and one for our new "downsized" home. They've cut the price so it's a very good deal too!" Review: "This bed is built to last. My old daybed was a piece of junk compared to this one. Solid, sturdy and arrived as promised." Review: "I love your beds AND your linens! So far, I have bought two tundle beds and a trundle/daybed. They are simple to put together and very sturdy. 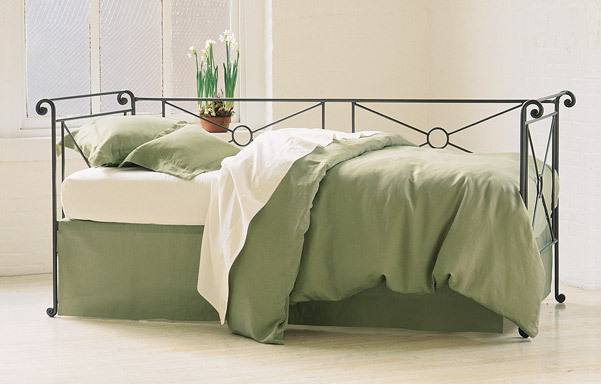 The elegant lines and curves of the iron beds are just beautiful. I have filled my daybed with pillows and use it as a sofa when not in use as a bed. It is great for small spaces. I found Charles P Rogers in Southern Living and would HIGHLY recommend it to everyone!" Review: "This bed is definitely of higher quality. Solid, and the welds are neatly finished. Hardware is real nuts and bolts that I believe are stainless steel. Not the cheap brass allen wrench bolts that you see at Ikea or Target or even some "higher end" places. It also comes with touch up paint that I did not need. The bed came very well packaged so there was no damage to the finish. I bought the smaller sized bed (not the standard twin). The smaller sized bed uses a special mattress that Charles P Rogers sells but I did not buy because I prefer to shop for mattresses in person. It was not easy to find the correct size at the local stores. Most had only cheaper uncomfortable mattresses in the "daybed" size. After some effort I was able to finally special order a high quality one for about the same price that Charles P Rogers was charging. Overall I totally recommend this bed." Review: "My daughter loves the bed and the mattresses are exceptionally comfortable. Not only does the bed look beautiful, but is very comfortable. I would recommend this to anyone who wants stylish furniture in the bedroom." Review: "I couldn't be any happier with this daybed. The campaign style is the perfect design for a small New York City bedroom/den. I purchased the premium mattress and it's very comfortable. It's the highest quality daybed I could find." Review: "Very pleased with everything, from the order itself to the quality and style of the daybed. Ordering was easy and the unit was delivered by friendly guys who assembled the bed right in my apartment, even leaving me a small jar of touch up paint. Scheduling delivery was very easy, with a friendly person on the other end of the phone. The style of the daybed looks great in my prewar apartment in Manhattan. This bed has a great clean look, and yet the hand made quality looks very much at home against the original architectural details of the apartment. We don't like fussy furniture, instead preferring a more modern, clean design. We were shopping this against Room"
Review: "Love...love our Daybed. The quality is better than what we expected. Like that the trundle turns the bed into a king. Great for adult guests, and perfect for the younger guest. We now have a media/play room for the grand children and a guest room for the adults, and have lots of space in the room. Awesome buy!" Review: "Loved this bed....It came promptly and was easy to put together. You do need 2 people to put together. My house guests that have used the beds all say it is soooooo comfortable. Perfect for tight spaces!" Review: "Extremely happy with this purchase - the 33" width was perfect for a guest room, and I am now able to accommodate a couple much more comfortably than I would be with a sofa bed. The frame is high quality, as are the mattresses, although they are quite firm. The design is much more sophisticated than most of the daybeds out there. The delivery was excellent, and the bed was fully assembled and set up by the delivery crew. The overall cost of the set was quite reasonable for the level of quality. My only suggestion is that I wish Charles P. Rogers would make bedding available for the 33" mattress size, as this can be difficult to find. Overall, no complaints at all - thanks for this lovely addition to my home." Review: "I converted a spare bedroom into my painting studio but still needed to be able to use it as a guest bedroom. I chose the Campaign Daybed and just love the way it looks! I put it together myself in an hour or so. I bought the trundle bed so I can use this as either a queen (side by side) or two twins. I spring for the top of the line mattresses, which are very nice (although firm), and the trundle is a snap to slide in and pop up. I debated between the 33" and the 39" and opted for the 33" thinking it would look and sit more couch-like, which it does. But I think if the main purpose is extra sleeping, I'd probably opt for the 39" if I did it again. I had to tailor the twin bedskirt to fit, and the sheets are a tad large, but not really a problem. From my phone call to ask questions and place my order, to the fast shipping and really nice delivery guy, it was a pleasure dealing with this company." Review: "P.S. You get a really nice screwdriver and wrench with the bed. Thoughtful touch and good marketing! :-)"
Review: "Quality is sorely lacking in today's world. It was refreshing to see such quality workmanship, even down to the wrapping for shipment. I would recommend my Campaign Daybed, definitely with the Chelsea Mattress option. Chelsea Mattress is firm but comfortable The style would fit into any decor.. I just wish Rogers offered skirts for this size. It does require two people to assemble." Review: "I am a grandmother who recently retired and moved into my son's converted garage/studio. Wanted a bed that looked nice and didn't take up too much room in my small space, so I bought the 33" campaign bed for myself, with no trundle. Figured I could store things under the bed if I had too! I was used to a memory foam mattress, so I worried about the firmness of the mattress, but quickly got used to it. Very comfortable. Also bought the sheets from Rogers, and they are high quality. Shipping was excellent, delivery perfect. The bed is very well made and definitely worth the price. I put it together by myself, but it helps to have two people because iron is heavy. I bought standard daybed cover and bed skirt set on Amazon, and they fit fine with no alteration, but the long side of the bed is against the wall, so you can't see the extra material. I use this bed every night, have had it for over a month. The grandchildren also love it with all the extra pillows I bought to make it more couch like during the day. Just have to watch to keep them from rough housing too much on the bed because the wrought iron could really hurt!" Review: "After our divorce and home sold, we took a small 2 bedroom apartment. I had no beds nor mattresses and we were sleeping on the floor in sleeping bags. Since we will be moving into a condo or townhome, I needed to make one purchase that I could move easily into other walk-ups, and repurpose into a guest room. A friend saw the Charles P Rodgers ad in House Digest, and found they make narrow width daybeds. It fit easily up the stairs down a 25" hallway, and is in a 9'6" x 9'6" square bedroom. The bedroom has two doors, one window, and a 36" radiator. It is tiny. This daybed saves precious space. I could put their dresser, nightstand, and toychest in the room and it doesn't feel crowded. The wrought ironwork is stunning and solid. The pop up trundle is so easy to pull out my kids do it. They are sleeping so well on the Chelsea mattresses that we have twice missed the bus to school. I would highly recommed!" Review: "Beautiful bed. Very firm, comfortable mattresses. Looks great in my room. Service is top-notch. 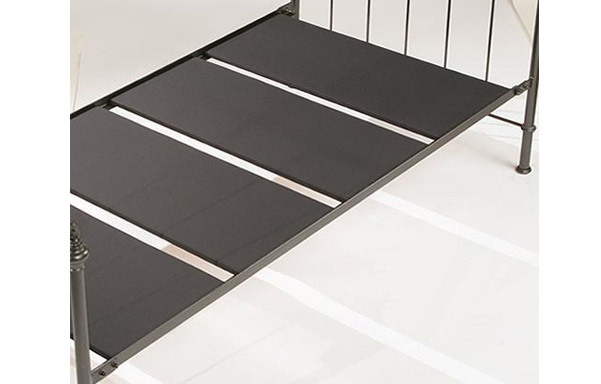 Only thing I would have liked would be a way to connect the trundle to the daybed for use as one large bed -- right now the trundle slips and slides away too easily. If you have any suggestions, please let me know." Review: "The overall quality of the daybed is excellent, particularly compared to most of what is out there. The upholstered platforms are far superior to the springs found on most daybeds. The trundle mechanism is first-rate and works very smoothly and easily. The design of the bed is lovely. My only complaint is with the Chelsea mattresses: they are hard as a rock. As I ordered the daybed in the space-saving 33" size and mattresses in that size are difficult to come by, I thought ordering the Chelsea mattress together with the daybed was the safest option. I personally find it very difficult to sleep on these mattresses, even with a pillow-top or memory foam topper (I've tried both). I'd strongly suggest that the company offer a softer alternative. These mattresses are okay for a child or an occasional overnight guest, but there's no way I could sleep every night on it, which I had been hoping to be able to do. That makes the overall unit of much less use to me than I had originally hoped." Review: "The Campaign Daybed is comfortable and attractive, and the pop-up trundle is easy to use. The only issue I have is that for the daybed (queen) size, it is impossible to find fitted sheets for the individual 33" mattresses (twin size is 39" and doesn't stay tucked in) and Charles P. Rogers has also discontinued making the bedskirt that fits this size daybed. So unless you want big bunched up clumps of fabric stuffed into the back, you're on your own for linens." Review: "Gorgeous bed, amazing price. White glove delivery was great. Highly recommend Charles P Rogers. I have a been a long time customer and their products are truly high quality for an amazing price."